Below are two more papers that will be presented this coming Saturday May 7th at The Annual Research Symposium of the Fashion and Textiles: History, Theory, Museum Practice Program at FIT’s School of Graduate Studies. Jacques Esterel, 1966 collections: “Mironton” (left), a Scottish-style plaid kilt ensemble, and “False Brother” (right), a vinyl pantsuit with zipped jacket ensemble. The Parisian couturier Jacques Esterel, known most famously for designing Brigitte Bardot’s wedding dress, launched a couture unisex collection in February 1971. The Institut National Audiovisuel in France has video footage of Esterel presenting the collection. “Alice 71 in Wonderland” is partially narrated by Esterel, who lends insight not only into his own thought process but also the collective spirit of the post-1960s generation. In the opening sequence, a male and female model walk hand-in-hand, smiling brightly and both wearing dresses. “If I am attempting to dress men not as women, but rather put men in dresses, it does not mean that they have to, but that they can if they want to. It is just another door towards freedom.” Unisex dressing represented a utopian dream for many, who were striving to achieve universal equality. In this paper, I will use “Alice 71 in Wonderland” as a framework for analyzing the breakdown of the fashion system and the gender issues that resulted from the events of May 1968, as seen in extant garments, photographs, interviews and articles, and supporting the conclusion that periods of crisis are not only foreshadowed by, but also directly result in, changes in systems of dress. Dress, the silent messenger, is one of society’s most powerful communicators. The message is purely visual, and relies on how it resonates with the observer. Further interactions are often informed by how one curates himself. Society relies on codified systems of dress, dictated by tradition, class, gender, age, environment or any combination of, and imposes a degree of expected adherence in order for the individual to be accepted. These are the norms that create cohesion within the societal groups. Throughout history crisis events have caused upheaval to present patterns of dress, forcing new, or limited choices, thus creating change. For instance, war can choke supply, strong religious shifts might compel modesty, or a personal event can impact the contents of one’s wardrobe. The central focus will be the Black Panthers; a group that used image and visual components to convey a message. In their message, they conveyed the need for change as a result of generations of crisis that arose from racism in America. I will assert that the impact of the Black Panther “look,” as an overall part of their presentation, had a persuasive influence and helped promote their message. As a group they used dress in an organized manner as a means of dissent, solidarity, unification, and identification, to add a visual conditions to a political agenda; dress became an extension of the group’s philosophy. This group has been chosen as a case study because they illustrate the how cultural, racial, individual and political identities, are separate components that intersect through the power of dress. In addition, the available documentation provides invaluable information for analysis, thesis development, and comparison. More importantly, the available documentation, which includes living party members, allows for an observation of the evolution of the relationship between fashion and reform. Lastly, it must be observed that the quantity and quality records is a result of the impact this group had on the media, and the media’s appetite for image-makers – and what this means in the modern age of communicating through the visual. I had the pleasure to be interviewed for the (relatively) new fashion history podcast Unravel. Jasmine Helms and Dana Goodin, two graduates of our program, have been doing such a great job in going deep into different aspects of fashion history. It’s really one of the best fashion podcasts out there, make sure you check it out! I had a conversation with Jasmine and Dana on the book I co-authored, She’s Got Legs: A History of Hemlines and Fashion. In addition to highlighting some of the themes and topics covered in the book I also go into details about the process of co-authoring, sourcing the images, and the pains of writing! You can listen to it on soundcloud or iTunes. I hope you can find the time to listen and let me know what you think. Below is another glimpse into the kind of papers that will be presented this coming Saturday May 7th at The Annual Research Symposium of the Fashion and Textiles: History, Theory, Museum Practice Program at FIT’s School of Graduate Studies. On June 14, 1940, the Nazi occupation of Paris began. The Fashion Group, an assembly of women formed in New York to promote and protect the business of fashion, called a meeting to discuss the impact this would have on American commerce. Having just recovered from the economic devastation of the Great Depression, it was pertinent to strategize a means of continued creation despite being cut off from French designs. Although some were hesitant to continue without the guiding force of Europe, it was decided that the best way to survive the uncertainty of war to promote a uniquely “American Look.” Despite hardships and limitations, professionals in the fashion industry joined together to forge a new direction that was uniquely suited for the contemporary American woman. Carmel Snow, a founding member of the Fashion Group and editor of Harper’s Bazaar, was dedicated to promoting the new recurring motifs of patriotism, elegant escapism, and American style in her magazine. Assisting her with this endeavor was staff photographer Louise Dahl-Wolfe (1895-1989). A pioneer in the field of environmental fashion photography, and a visionary with color Kodachrome film, Dahl-Wolfe became one of the preeminent contributors to Harper’s Bazaar during the World War II era. The extensive collection of Dahl-Wolfe’s fashion photographs offers visual documentation of this formative period. Dahl-Wolfe’s photography exemplifies the themes adopted by Bazaar, and highlights even the most nuanced implications of World War II in American fashion. In this paper, I will examine the photography Louise Dahl-Wolfe produced for Harper’s Bazaar from 1938 to 1950. The images, along with copies of the magazines in which they originally appeared, will be analyzed as the extant manifestation of the American fashion industry’s reaction to the turbulent World War II era. Findings within these photographs will support the conclusion that the Louise Dahl-Wolfe photography collection is an important and unique primary source recording this formative period in American fashion. Literature – both scholarly non-fiction and fiction – has addressed this iconic garment, exhaustively piecing together its unknown history, cultural significance, and fashion provenance. This paper does not intend to offer another piece of the suit’s historical puzzle. Rather, it uses Kennedy’s suit as a case study in considering the talismanic nature of cloth and clothes, particularly in tragedy, grief, and even its consequent sensationalism. Those of you who have followed the blog, must have noticed that beyond our lively facebook page I haven’t posted in almost two years. It’s not because I got lazy or shifted all my attention to posting links on FB, but because during this time I was laboring over my first book, She’s Got Legs, which comes out this week from Schiffer Publications. The book, co-authored with Jane Merrill, has really been a labor of love and I am so thrilled it is finally out. The book is a fashion history survey from antiquity to present day which aims to examine, study, and explore the relationship between body and clothes from the waist down. We offer a lens from which to look at attitudes toward exposure, concealing, and shaping of the lower-body and a complexity of influences on beauty and body ideals through the ages. Some of the topics we cover are posture, undergarments and shaping of the body, sports and fashion, dance and fashion, the hemline history, and swimwear to name a few. Please follow the book’s facebook page for announcements on book giveaways, talks, and other events, in addition to exclusive previews and sneak peeks. If you order the book on Amazon please leave us a review so we know what you think of the book! For our special fashion issue (issue #32 // April 13, 2014), I decided to interview my friend, colleague, and classmate Tracy Jenkins. Tracy is currently working at the Costume Institute at the MET as a research assistant in the collections management department. She also teaches NYU’s student exhibition class, where the students are required to come up with a topic to center an exhibition around. I was actually in F.I.T.’s version of the class with Tracy, and thought it would be interesting to interview her because she experienced the class both as a student and as a professor. Christine Zhu: Hey Tracy! 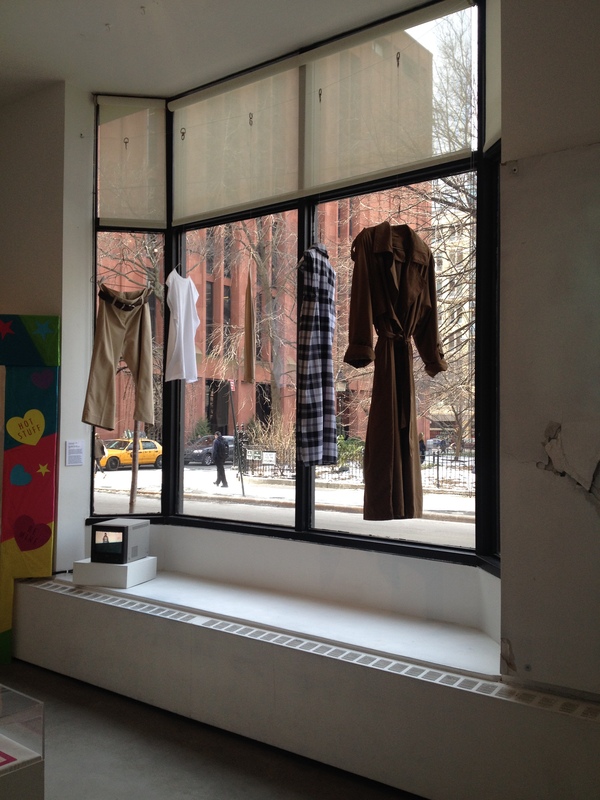 Thanks for taking the time to do this interview about your experience as the professor of the NYU Visual Culture: Costume Studies MA Program’s student exhibition class for Packet! Wow, that was a mouthful! Tracy Jenkins: Hi Christine! You’re very welcome. Thank you for asking me to participate. CZ: First of all, this is your first time teaching, right? I remember being in FIT’s version of the class with you, when you acted as co-curator, with Cassidy Zachary. Can you tell us a little about what you took away from that experience and how you applied it to the class you taught at NYU? T.J: This was my first time teaching, yes. As you know, and as we’ll talk more about in a minute, the NYU class is structured differently from the one we took at FIT. From a teaching standpoint, this is ideal because I can borrow the most successful aspects of the FIT class and graft them onto mine. For example, the additional roles that each student must take on: registrar, exhibition design, graphic design, PR, and education. Working directly with the Museum at FIT taught us exactly what those roles encompass within an institution, which gave me a framework to present them to my students, who were essentially independent curators. I also made sure to include guest lecturers who could speak to different kinds and experiences of curation, as well as to ancillary duties such as fundraising, label writing, etc. CZ: I’m seriously loving this idea of a democratic approach to curating an exhibition and having eight curators, each responsible for choosing an object and researching it rather than just one curator’s vision. How did you arrive at this structure? What were some pros/cons to this approach? TJ: It was actually nine curators! I cannot take credit for the approach; it is how the class, now in its third year, has been structured from its inception. I like that you used the word “democracy” in your question, because it’s an apt comparison. Everyone had a voice, and a vote, in every decision. It makes for some inefficiencies, but I think they are valuable ones, especially in a teaching environment. Part of the measure of success of the class, for me, is that each person feels ownership and agency. So you have very different, often opinionated, individuals working on a collective endeavor that has to result in a cohesive whole. Ultimately the choice of object and how to present it was the decision of each of the curators, but there were so many rich conversations leading to those choices that I’m not sure we would have explored had everyone not felt equally invested. CZ: Can you describe how you/your class arrived at the topic: Runway Moments: New York Fashion Week? TJ: We were several classes in to the semester without a topic, not yet a crisis but I think I had said we ought to pick something that evening. I had some ideas on the board to get started, and was soliciting suggestions. This was during the S/S shows in New York, so students were talking about current designers and what was going on in the collections. Then someone said, “what if our topic was New York Fashion Week?” and it just clicked. The vote was unanimous, myself included. CZ: Let’s discuss the idea of the fashion show. Caroline Evans, in her new book, The Mechanical Smile talks extensively about how the fashion show was a reflection of modernity at it’s inception and solidification around the turn of the century – everything from the way the models moved, to the role of women, etc. Do you think this idea of the fashion show is still a reflection of modernity today? TJ: Caroline Evans is a deeply brilliant thinker whom I will not do justice to with this response. Hmm, is there “modernity today”? How would you define it? I’m not sure what historical moment we’re in, with regard to modernity, post-modernity, or something else, but I do think that fashion shows are a direct reflection of their times, if that isn’t too simplistic an observation. Fashion mirrors and sometimes predicts the future, and its modes of presentation – including fashion shows — support and enhance that. To the extent that fashion shows have become part of popular culture, and are increasingly viewed by those outside the industry, they reflect those influences as well. CZ: I f you were to include yourself as a curator in the exhibition planning process, what object and New York runway moment would you have chosen? TJ: I have no idea! Is it strange that this never crossed my mind? My belated ideas would be to somehow represent Eleanor Lambert [who in the 1940s organized New York’s biannual fashion presentations into “Press Week,” which ultimately became New York Fashion Week], or Bill Cunningham’s work and/or street style during the shows. CZ: What qualities do you think make a good curator? TJ: In no particular order: curiosity, openness, honesty, flexibility, decisiveness, diplomacy, collaboration, patience, humor, communication, and tenacity. Hand skills are also great. Be a Renaissance (wo)man, no matter what you do. CZ: Were there any runway moments that your students decided to omit? Why? TJ: There were. The most memorable example is a New York Times photograph taken by Bill Cunningham on September 11, 2001, of Fern Mallis consulting with staff outside the tents. The photograph was taken just after the attacks on the World Trade Center and captured part of the discussion that resulted in the decision to cancel all subsequent New York Fashion Week shows and events that season. The class supported the student’s choice and sensitive handling of this powerful moment, but she as its curator ultimately decided she would prefer not to include it. CZ: The gallery space you worked with seems very limiting in terms of size. How did your students work around this? TJ: It’s a small gallery with a great location and curb appeal, so that’s the trade off. Most of us had seen the previous year’s exhibition, so we had an idea of the space’s limitations going in. We made early visits to the gallery and spoke with the director and registrar about what was possible. One advantage was that we had only two dressed mannequins (out of a potential nine), which require a footprint that objects on the wall do not. We had a mandate to include media other than garments, which was a blessing in terms of utilizing a small space. CZ: I really loved that Runway Moments featured various mediums such as video, text, photography, etc. that really engaged the viewer and kept their attention. I recall this being a non-negotiable requirement of our exhibition class, which was rather tedious to plan and install, but ultimately very rewarding. Can you describe this process? TJ: It was non-negotiable from my point of view as well! The inclusion of mixed media is something the program director feels strongly about, and I agree. It’s both a practical and ideological consideration in this case: the space can’t easily accommodate a mannequin for every curator, nor is a dressed mannequin the best representation of most of the chosen runway moments. Curating an exhibition necessitates contextualizing the material in a way that communicates it successfully to the audience, be it through material objects, a recording of an event or performance, or a recreation through words and images. On a purely aesthetic level, I think that in a small space, mixed media makes for a visually appealing show. I also think that in the case of a fashion exhibition, it’s valuable to remind viewers that fashion does not equal clothing. Static garments are only part of the story; clothing on the fashionable bodies of its time, in motion, can add a necessary dimension, as can ephemera, recreation, etc. CZ: The show is comprised entirely of objects that were not borrowed from a museum. Can you talk a little about this alternative method of curating where everything has to be acquired rather than borrowed? TJ: It’s the best of times and the worst of times. It’s great in the brainstorming phase because ideas are unfettered by the limitations of a collection. But then you realize certain “runway moments” don’t have extant objects, or none you can locate, or that there are other issues of space, time, and money. It’s a useful lesson in that much of curating, particularly without a collection to draw from, is logistical, sometimes tedious, work. But the investigation of alternate methods of presentation got us to some interesting places, and in many cases the curators’ ideas were better served by not finding a piece of clothing to represent them. Several objects were fabricated by the students themselves, which is not something most curators have to contend with. Greenberg, Reesa, Bruce W. Ferguson, and Sandy Nairne, Editors. Thinking about Exhibitions. London: Routledge, 1996. Chapters 10, 14, and 23: “Creating Spaces,” Gerald McMaster, pp. 191-200(10). “Constructing the Spectacle of Culture in Museums,” Ivan Karp and Fred Wilson, pp. 251-267(17). “A Visual Machine: Art installation and its modern archetypes,” Germano Celant, pp. 371-386(16). Karp, Ivan, and Steven D. Lavine, Editors. 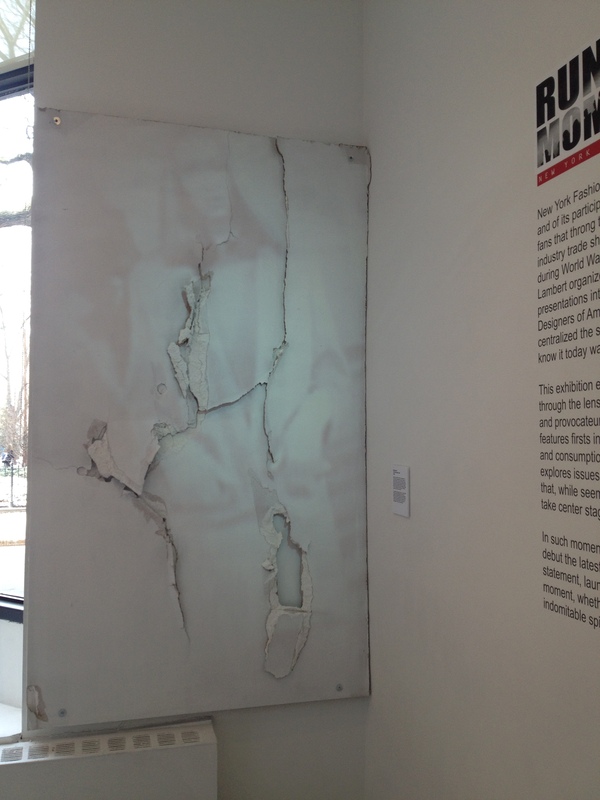 Exhibiting Cultures: The Poetics and Politics of Museum Display. Washington: Smithsonian Institution Press, 1991. Chapter 1: “The Museum as a Way of Seeing,” Svetlana Alpers, pp. 25-32(8). O’Doherty, Brian, and Thomas McEvilley. Inside the White Cube: The Ideology of the Gallery Space. Berkeley: University of California Press, 2008. Chapter 1: “Notes on the Gallery Space,” pp. 13-34(22). Prown, Jules David. “Mind in Matter: An Introduction to Material Culture Theory and Method,” Winterthur Portfolio, Vol. 17, No. 1 (Spring, 1982), pp. 1-19. Rand, Steven and Heather Kouris, Editors. Cautionary Tales: Critical Curating. New York: apexart, 2007. Steele, Valerie. “A Museum of Fashion Is More Than a Clothes-Bag.” Fashion Theory, Vol. 2, No. 4 (November 1998), pp. 327-335(9). Taylor, Lou. “Doing the Laundry? A Reassessment of Object-based Dress History.” Fashion Theory, Vol. 2, No. 4 (November 1998), pp. 337-358(22).